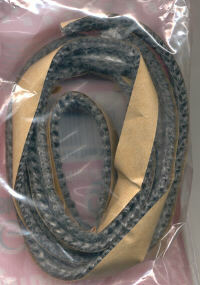 A fiberglass tape gasket designed to replace worn or burnt out gaskets around the windows in the frame of a woodstove, coal stove, or fireplace insert stove door. Easy to put on because it is backed with a peel-and-stick adhesive. Just remove the glass from the door, clean it, encase the edges in gasket and screw back into the frame. Fiberglass withstands tempertures to 1000°F. Black color does not show around windows.